In recent years we have seen significant development when it comes to using technology as learning tools. 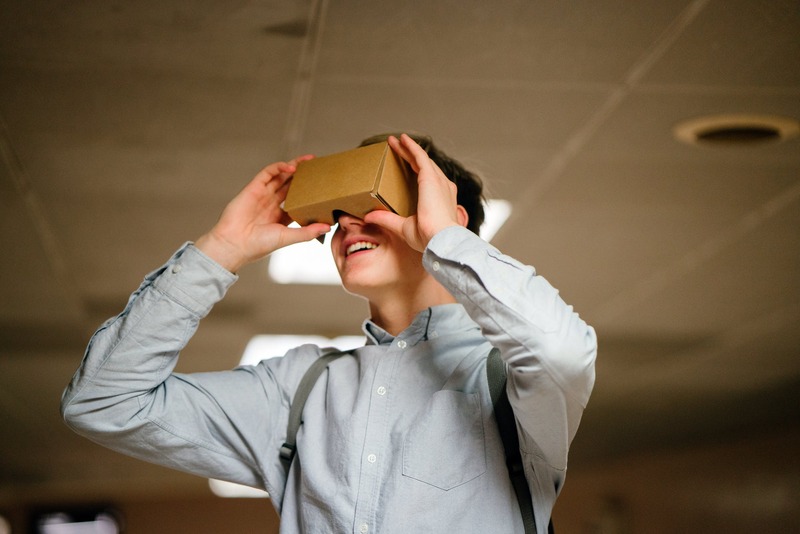 As education technology has improved over the years, it has even been claimed that technologies like virtual reality (VR) even can enhance our capacity for empathy. The demand for empathy technologies originates from educators both in schools and corporate environments who have a mandate around meaningful collaboration. In Norway, and probably in several other countries as well, business leaders are increasingly touting empathy as a critical leadership trait. As the world is getting more segregated, diverse and isolated by the day, out need to expand our circles of empathy has never been more urgent. On the other hand, teachers who are on the front lines of this growing diversity consider it their job the help both students and employees to became more competent perspective-takers. As VR lets you take the role as the protagonist by letting you see, hear, and sometimes feel the same things as its central subject, it has been claimed as a natural tool for sparking our empathy. Today we can experience being a fireman, a cow, or even coral trying to protect itself from increased ocean acidity. As you don’t just get to walk in someone’s shoes, but get to see the world through their eyes, the virtual reality headset is often claimed to be an empathy machine. The empathy machine concept reached the mainstream through a TED talk with producer and VR guru Chris Milk. In 2015, he presented his project Clouds over Sidra, where we get to follow a young girl’s day in her life at a Syrian refugee camp in Jordan. At that time, Milk argued that since VR makes you feel like you are walking around in a camp surrounded by refugees, you will change your attitude towards others. Following that young girl in virtual reality is enough to enhance your empathy skills. But is it, really? In my opinion, experiences like the one in the refugee camp might let us feel sympathetic. We feel sorry for the girl, but we don’t necessarily get the idea of how living in a refugee camp on a day-to-day basis really is. Sympathy and empathy are not just two diverse approaches to confronting the emotional challenges of others; they are diametrically opposite responses in several ways. Sympathy tends to place another’s problems at a distance from us, placing us in a position of superiority. On the other hand, empathy requires that we internalize the feelings of another. In 2017, Facebook CEO Mark Zuckerberg failed hard with his “tone deaf” virtual reality tour of hurricane devastated Puerto Rico. He sent his happy and curly-haired avatar to the destroyed streets of Puerto Rico along with the leader of Facebook’s social reality team, Rachel Rubin Franklin. While Zuckerbergs and Franklins cartoon avatars floated along the streets, he commented the “magical” quality of virtual reality. It didn’t help when their avatars laughed and high fived against the backdrop of flooded streets and homes. While his intention was to use technology to generate empathy towards the disaster, the VR tour in Puerto Rico veered towards satirization of tech demo culture. According to Forbes, this was a case study of what happens all too often when Silicon Valley tries to apply its technological capabilities to the humanitarian world. The disaster itself became secondary to the technology demo. Now, the first wave of VR theory in the 1990s was not as explicitly tied to empathy as an end goal as it is today. Back then, people cared more about “new technologies of corporeality” and “malleable body boundaries”. They wanted to generate new definitions of what it meant to be human, expand our consciousness and create cyborgs. Empathy is often seen as a “soft skill” that schools and education systems in general are not set up to impart. It doesn’t mean it is not important; it is actually more important than ever as the need for social and emotional skills will rise sharply over the next years. Virtual reality can indeed be a powerful tool to introduce people to situations that requires empathy, or adopting new perspectives. But VR is not a silver bullet; it needs to be nested in a broader framework of goals, visions and relationships. Maybe contemporary VR needs to let go of empathy as a goal and start using it as a technique.